For young artists new to New York City in the 1870s, finding a place to live and work was tough. Landlords and boarding-house owners looked at bachelors with suspicion. Money was always tight. Which is why a local businessman built this six-story red brick apartment building on Washington Square East in 1879. Its rooms were intended for unmarried men only. The name, the Benedick, reflected the clientele: Benedick is the bachelor in Much Ado About Nothing. 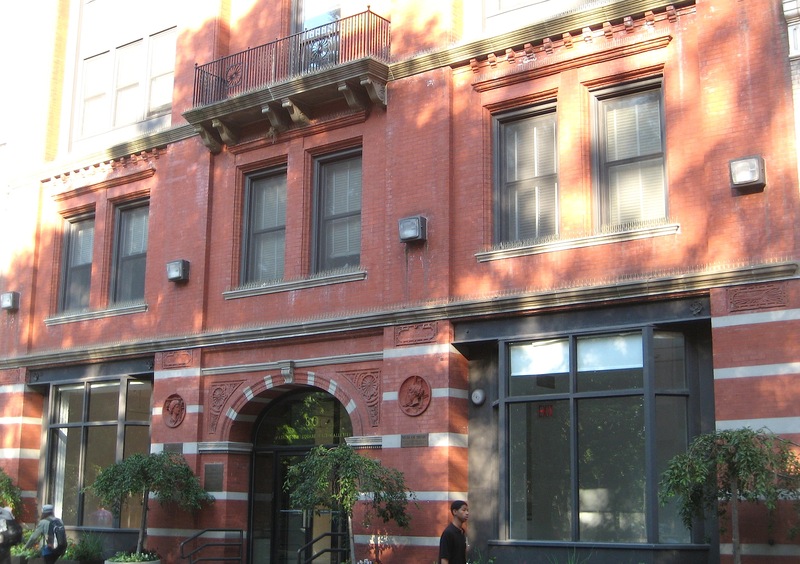 Because the Benedick had studios on the top floor, it attracted artists, such as Winslow Homer (left) and John LaFarge. Things may have gotten smutty there in the 1880s. That’s when it became home base for the Sewer Club, which included Stanford White and Augustus St. Gaudens. The Sewer Club could have been innocent fun, but since notorious womanizer Stanford White was a member, well, probably not. By the 1920s, the Benedick was bought by New York University; bachelor artists had to find living quarters just like everyone else. This entry was posted on June 18, 2010 at 4:00 am and is filed under Cool building names, Music, art, theater, West Village. You can follow any responses to this entry through the RSS 2.0 feed. You can leave a response, or trackback from your own site. I’m almost certain that I book I read in college had its opening scene set in this building. Perhaps House of Mirth? Does anyone else know what I’m remembering here? Interesting–I just did a quick search of House of Mirth and yes, the Benedick is mentioned in the opening scene. But this Benedick is on Madison Avenue and is described as having a porch. Perhaps there were two apartment buildings with this name, or maybe Edith Wharton rearranged the city a bit to suit her fiction? The Benedick also appears in “The Repairer of Reputations”, one of the fantasy stories in “The King in Yellow” (1895) by Robert W. Chambers, where it is home to the insane narrator Hildred Castaigne. According to the net Chambers himself lived there at one stage. The curious aspect of “The House of Mirth” is that Edith Wharton has a fictional character, the not terribly pleasant businessman Simon Rosedale, owning the Benedict. Did she know the real owner, one who perhaps didn’t mind being fictionalized? Further to the above, I thought it might interest readers to add that “The Yellow Sign”, another supernatural story in Chambers’s “The King in Yellow”, is set in a second apartment block overlooking Washington Square. 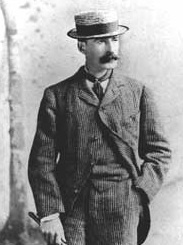 The narrator, the painter Jack Scott, lives in the Hamilton Apartment House. I don’t know whether, like the Benedick, this actually exists or existed. He says there is an unnamed Catholic church next door. H.P. Lovecraft acclaimed this story as one of the great works of weird fiction. I wish I could give precise dates for the setting of the “King in Yellow” tales, but it’s complicated by the fact that Hildred Castaigne, the narrator of “The Repairer of Reputations”, says the year is 1920, but he is plagued by delusions and is a most unreliable narrator. Readers might wish to seek out Chambers’s great book, which is available in online versions and in U.S. paperbacks, and make up their own minds about the time-scale of the tales. Look out for the contradiction about the Garibaldi statue in the square. A deliberate mistake? My paternal grandfather’s law partner (Spalding & McCabe) and confirmed bachelor Lyman Austin Spalding (1868-1949) was a frequent summer guest at our family summer home in CT. In July 1921, he signed the summer guestbook as a resident of 80 East Washington Square; in 1922, he listed The Benedick, NY, as his residence. This was a very intellectual crowd and, thus, am glad to know of the literary references. Where might photographc images of the facade ca. 1920 be accessed? Great info, thanks for sending it in. Have you tried searching through the New York Public Library digital image database? It’s a fantastic resource. Washington Square’s neighborhood of apartments must have been an artist’s haven. It is impressive to read who lived and worked near whom in this area of NYC!